One of two complete outfits from Gaziantep in our collection is pictured on the left. This costume is from an area that was known for Shamanism; blue representing the sky and brown the earth. The belt is gilt finished, hammered metal; the leather shoes are worn over colourful woollen socks. Turkey is a huge country, and there are many different regional variations in the traditional costume. We have tried to incorporate the main characteristics in our costumes. Turkish dances are popular with the group, and we have accumulated pieces of original costumes and made copies with authentic fabric. We have also used similar garments that are commercially available in this country. 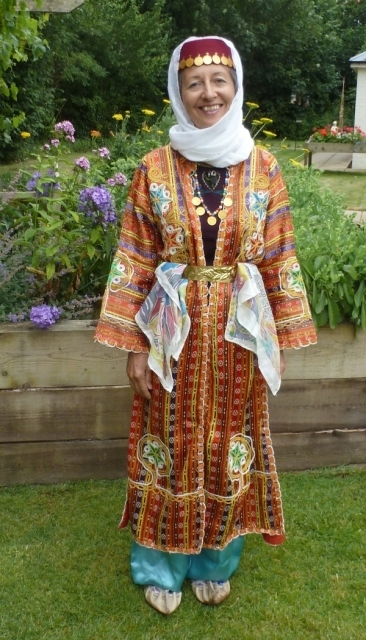 The most distinguishing feature of Turkish women's costume are the salvar (baggy trousers). Another is the uz etek - a long jacket - with or without sleeves - it has open sides which can be tucked up for work and/or used to hold a baby, etc. A scarf is usually worn, sometimes over a small hat or a headdress. Coins, beads and other decorations are another common characteristic.